There are those who dream of being motorcycle event promoters, maybe even put on an event for two or three years then crawl under a rock never to be seen again. And then there are those who create one event, take it to a level of success, maintain it and at the same time create another and just keep the good times coming. 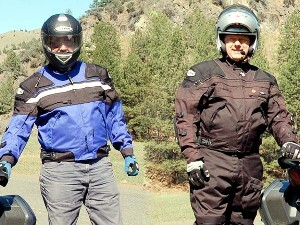 Meet the Folkestads, Steve and Eric, a team of two brothers from the Vancouver/Portland area who created the Hells Canyon Motorcycle Rally, The DamTour and are now in the throws of planning the Canyons Tour. SR! : Where did you two grow up and who always won when there was a tiff? SF: Eric was born in Salem, OR and I was born in Missoula, Montana. We grew up in Salem and because we were from a family of 7 boys I never fought with Eric, but focused my efforts on a couple of older brothers. EF: Hah! Steve was the oldest and won every time. SR! : You started with the DamTour. How did it come about and how long have you been doing it? SF: DamTour is in it's fifth year and started in 2004. It all started when Eric and I were talking about needing some damn good places to ride. Well, like most of these things several days go by and then the idea hits that it should be NW Dams. 20 dam good places to ride. Eric was working at Action Motor Sports in Vancouver at the time and so we just launched it. Picked the dams and made the rider cards and took off riding. That first year we only had maybe 20 riders and now each year it has grown to where we have over 100 today and they are pretty well committed. 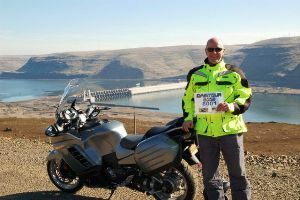 If you decide to go to all twenty dams, 8 in Oregon, 8 in Washington and 4 bonus, you will rack up something like 15k miles on your bike. A very high percentage of the riders are repeat from year to year and really look forward to the new dams and the adventure that they bring. SR! : Has it been a lot of fun learning the history of each dam over the years? Do you enjoy sharing that part of your experience with registered riders? SF: Other than the fun of the actual ride, it is really interesting to see from our little blog what other riders learned about the dam and the surrounding area. It's also interesting to see where they decide to take their picture. Sometimes everyone will take their picture at the same spot and other times they will all have a different perspective. We always like to see ride reports and most of the riders are happy to write their story. Steve Folkestad along the DamTour route. SR! : Next up was the creation of the Hell's Canyon Motorcycle Rally. How did that come about and how has it evolved? SF: Main Event Eric said, "we ought to make this into a rally." So we did. Our first big year was 2006 with 4517 riders. WOW! Then 2007 saw the rally grow to 6000 riders and this year looks like even more. You don't need any directions. Those who have pre-registered have now been invited to follow this rider straight to hell! SR! : Last year it was a K9 unit. This year you've brought a little something special to Baker City via Miss Oregon. Elaborate. SF: Miss Oregon was at the rally in 2007 and the new Miss Oregon is coming in 2008. We just got lucky there and now have started what we hope will be a lasting tradition. Miss Oregon was very well received by the people of Baker and the bikers and it's great fun to have her down on Main Street presenting the trophies during the Hells Canyon Motorcycle Show Saturday night. EF: This year we're giving two new Kawasaki KLR650 dual sport motorcycles to the Baker City Police Dept. Steve and I really worked hard to raise the money for this project. It's hard to imagine the cops not having any bikes! Miss Oregon delivers a new KLR650 Police bike to the Baker City Police. SR! : Getting the field at the high school was a major breakthrough this year. How many can you accommodate there? SF: Jerry, the principal at Baker High, will open ALL 3 of their practice fields if the need arises. Each field can hold about 250 so we have a little room for expansion. SR! : What are the highlights for this year's event? SF: As always, the total experience is the number one attraction. From the ride over, to the time in the bar recounting the day's ride, to the poker run on Saturday, to the Bike Show and the scene on Main Street, to the ride down into the canyon and the ride home. The whole thing is about discovering the 'Real Oregon.' With it's endless beauty, friendly people, great roads and remote location � NE Oregon has become a must-do ride for bikers everywhere. SR! : Now you have a new trick up your sleeve. The Canyons Tour. What is it and how can someone get in on the ride? SF: This is in the planning stages right now, but goes something like this. Tour the Western Canyons. From Hells Canyon in the NE, to The Grand Canyon, Four Corners, Bryce Canyon, Glen Canyon Bonneville Salt Flats. Do the whole thing in one 10-day trip! Smaller groups, maybe 6 to 10 riders, led by one or two experienced guides on the trip of a lifetime! SR! : So now what? SF: Who knows? Eric and I both believe that the real success for the motorcycle industry is based on getting the customers to actually use their bikes and discover the stunning landscape of the great west! So we will keep dreaming up rides that will inspire bikers to get out on the road and take life by the handlebars!